You should all have a neighbor as sweet as my little neighbor Coco. She knocked on my door this morning and presented this beautiful portrait of Dexter and Tracy. Dex and Tracy are pretty fond of her too. 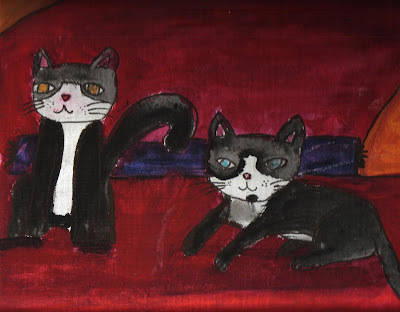 that is beautiful -- are they sitting on your new sofa in this portrait? Yes! She portrayed them perfectly on the new red sofa!